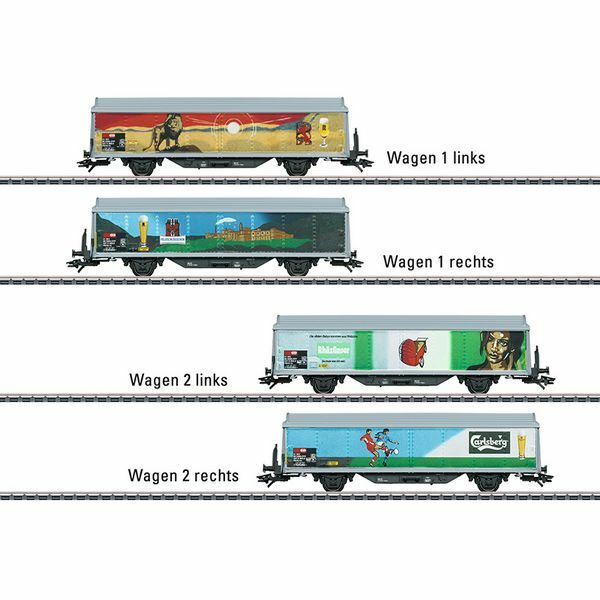 Prototype: Two (2) Swiss Federal Railways (SBB) type Hbils-vy two-axle sliding wall boxcars. Both cars with smooth side walls. Each car decorated with different themes for the brewery Feldschlösschen, Rheinfelden, Switzerland. The cars look as they did around 2005. Model: The car frames have "fish belly" side sills. Both cars have different car numbers. Each car is imprinted with 2 different themes on the sides. Length over the buffers per car 16.8 cm / 6-5/8". DC wheelset E700580.